Abstract: This article presents a sketch of the prehistorical development of the Common Slavic preterital imperfect/aorist category. The methods of in¬ternal analysis and linguistic geography are applied to mostly well-established data in order to reconstruct major elements of this development, in particular the relative chronology of the main morphological changes, correlations with well-known Common Slavic phonological changes, as well as correlations of regional morphological differences with major phonological isoglosses. The results contribute to our understanding of the development of Common Slavic and its dialectal differentiation in the period of the “Slavic migrations”. Abstract: Most treatments of temporal semantics start out from the conception of time as a line stretching from the past into the future, which is then populated with eventualities or situations. This paper explores how time can be seen as emerging from the construction of representations of reality in which the basic building blocks are static—i.e., timeless—representations, which are connected to each other by events that are transitions between them and that create an ordering which can be understood as temporal. This connects to von Wright’s “logic of change” and the “hybrid semantics” suggested by Herweg and Löbner. In this context, telicity is seen as the capacity of events, or of the predicates that express them, to “create time” in the sense of defining a before and an after. The basic elements of the model are global states, which are timeless taken in isolation but are connected by transition events, which transform one global state into another and thereby define the temporal relationships between them. Transition events, corre¬sponding to Vendlerian achievements, represent simple changes which are then the basis for all other constructs in the model, most notably delimited states, Vendlerian activities (atelic dynamic eventualities), and accomplish-ments (telic non-punctual even¬tualities), but also time points and intervals. Transition events are further in-strumental in constructing narrative structures and are responsible for narrative progression. 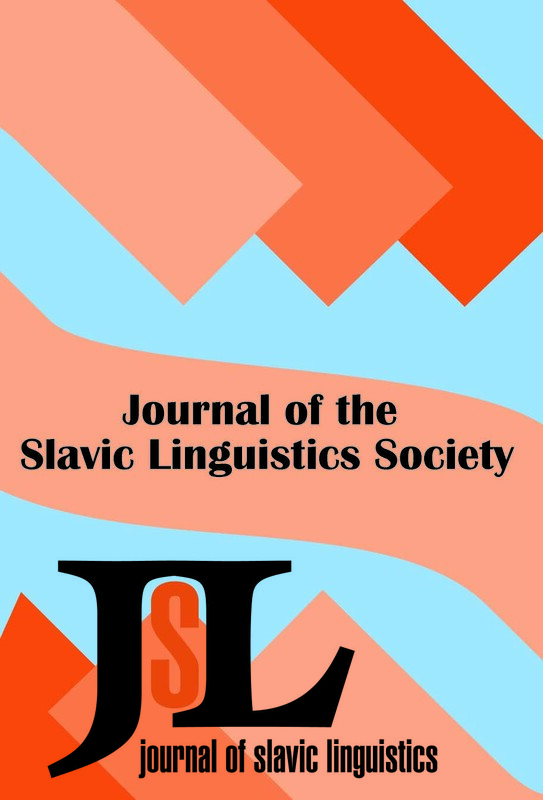 Abstract: This article argues that Czech retained a semantic distinction be¬tween the expression of current relevance/emphasis and a neutral preterit in third-person compound preterit forms until the late sixteenth century. The distinction was expressed by the presence (expressing current relevance/em¬phasis) vs. absence (neutral preterit) of third-person auxiliaries. The hypothe¬sis is based on data from two late fourteenth-century narratives (Asenath and The Life of Adam and Eve) and from letters written by or to Czech women from 1365 to 1615. The results of statistical analyses are presented as support for the hypothesis, and it is suggested that the continued distinction between current relevance/emphasis and a neutral preterit in the third person is in part responsible for the fact that the two-way use of imperfective verbs never be¬came a major usage pattern in Czech, in contrast with Russian, where the tense system was reduced relatively early. Abstract: This paper explores the history of suffixed semelfactive verbs in Russian, i.e., verbs like maxnut’ ‘wave once’ with the nu suffix. It is argued that the semelfactive aktionsart is best analyzed as a radial category organized around a prototype with four properties: uniformity, instantaneousness, non-resultativity, and single occurrence, which are defined and discussed in the article. This paper further demonstrates that there is a small group of verbs denoting bodily acts that meet these criteria in the Old Church Slavonic texts, thus suggesting the existence of an embryonic version of the semelfactive aktionsart in Common Slavic. Although the cue validity of nu as a marker of semelfactivity remains stable, in Old Russian nu with semelfactive meaning is shown to spread to auditory verbs, optical verbs, and verbs of physical movement, which are argued to constitute a radial category organized around prototypical bodily acts. This gradual expansion through the lexicon continues in Contemporary Standard Russian; in particular a number of semelfactive behavior verbs have emerged, although many of them are of low frequency. Verbal Prefixation and Metaphor: How Does Metaphor Interact with Constructions? Abstract: This article argues that metaphorical and non-metaphorical content find different expression on the constructional level. The hypothesis is supported by two empirical case studies of the Russian Locative Alternation verbs, based on the data from the Russian National Corpus: the unprefixed verb sypat’ ‘strew’ (which does not have an aspectual partner) and the unpre¬fixed verb gruzit’ ‘load’ and its three perfective partners with the prefixes na-, za-, and po-. It is argued that metaphorical extensions of these Locative Alter-nation verbs have a strong relationship with elaborations (interactions be¬tween different constructions), on the one hand, and reduction (Locative Alternation constructions with a reduced or omitted participant), on the other. The results indicate differences in metaphorical behavior of different prefixes (even when they are used to form perfective partner verbs) and different constructions (some constructions are more often instantiated as metaphorical extensions than the other).